Life was not meant to be easy. It was meant to be a treacherous obstacle course, a cruel gauntlet, and right then I was in the thick of it. Hunter is stuck in a car with his family as they travel up the Queensland coast. It is a trip that his mum thinks will bring the family closer together, especially now that his stepdad and baby brother are part of the mix. But with tension and secrets sizzling beneath the happy family facade, the road trip soon becomes Hunter's worst nightmare. The further away from home he gets the more he can't shake thoughts of the accident that took his dad away from them. Forced out of his comfort zone, Hunter tries to embrace life on the road. Between campsites he parties with friendly backpackers on the beach, has one too many close encounters with wild animals and finally meets a girl who actually understands how he feels. But is it enough to help him deal with the real reason his family set off on their journey in the first place? Sixteen year old Hunter is stuck in the car with his family, on an impromptu road trip up the Queensland coast. Six weeks without his friends or social media, and home schooled by his mother and step father. Hunter spends each day gazing out the car window at the arid Australian outback, while bickering with his ten year old sister who had down syndrome and lastly, the baby. His half brother. But Hunter despises being dragged along on his mother's journey of self discovery, but with her fragile state and having nearly lost her once before, he admits defeat. Hunter and this stepfather have a strained relationship, he resents his sister calling him Dad, a title which he'll never hold as far as Hunter is concerned. But as Hunter begins to take in his new surroundings on the road, he sees that perhaps not all is lost and begins to enjoy exploring the flora, fauna and meeting other campers. Especially Sophie who understands his turmoil. But life is cruel and when sister Pippa is involved in an accident, his world will unravel and he discovers the real reason for their impromptu road trip isn't what it seems. Sandy Feet is a wonderful contemporary about life, finding your feet, acceptance and a sense of family. If there was a defining moment that made a boy into a man, I think that was that particular moment for me. Right there on the side of the road, on the way to Cairns Hospital, outside the crocodile farm, something changed. Something shifted. Told from sixteen year old Hunter's perspective, he's angry and frustrated and wants nothing more than to be home where he can access social media, play games and hang out with his friends. But instead he finds himself fighting for the window seat on a three week long road trip up the coast. Although his mother remarried after the collapse of her marriage, Hunter has never accepted the man he calls Step as a member of their family. He even resents sister Pippa for referring to him as her father. At first Hunter is seemingly the average teenage boy with a chip on his shoulder, but as his story unravels it soon becomes apparent that his anger can be justified. I found the family dynamics wonderful. Pippa with down syndrome who really doesn't need any assistance. She's sassy and I loved her ability to stand up for herself. Their mother seemed to waver between loving mother, stern authority figure and carefree spirit. Although she was clearly dealing with her own crisis, she seemed to neglect Hunter's emotional well being. Angry, sullen and withdrawn, it was the typical teenage cry for help. But surprisingly under the circumstances, Hunter otherwise seemed like a well adjusted teenage boy and I struggled to find any deeming qualities within his mother. His step father was the more engaging of the two, taking on a family with existing complications yet he still wanted to be part of the children's lives. I really felt for his character, it can't have been easy trying to engage with a teenage boy but he seemed like the most reliable and solid figure Hunter had in his life. 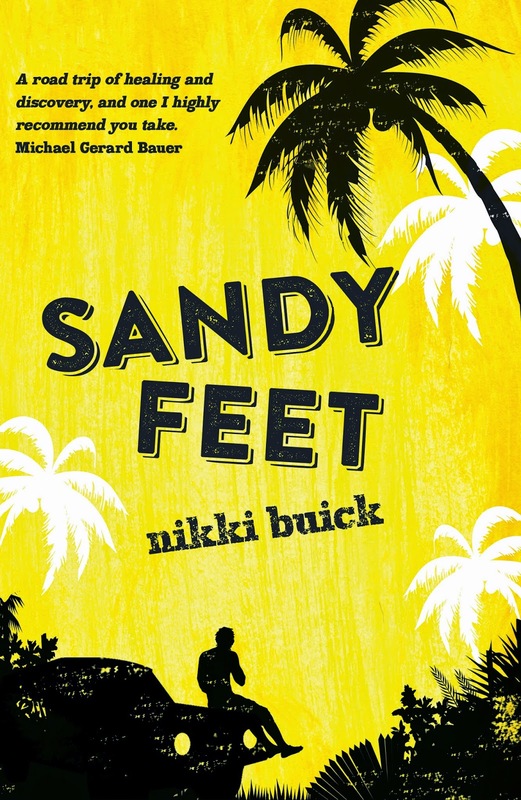 But Sandy Feet felt a little repetitive, as the interactions between Hunter, family members and other travelers were too few and far between and the teen spend his time either absorbing the monotony of the scenery or reflecting on how the life he left behind is forging on without him. Hunter also recalls on memories of his father, who is now no longer in his life and I felt incredibly sorry for what he and Pippa have endured. I really enjoyed the fluent character dialogue especially, it gave realism to this being a family that you could find practically anywhere around the country. I think he was more of a typical teen boy, obsessed with his Xbox, Facebook and finding a girl to amuse himself. But he did seem young though. I put it down to more than girls mature faster than boys and I think most young adult teen males seem a little more mature than they probably should be.